American lawyer, soldier and politician, born in Deerfield, New Hampshire, on the 5th of November 1818. He graduated at Waterville (now Colby) College in 1838, was admitted to the Massachusetts bar in 1840, began practice at Lowell, Massachusetts, and early attained distinction as a lawyer, particularly in criminal cases. Entering politics as a Democrat, he first attracted general attention by his violent campaign in Lowell in advocacy of the passage of a law establishing a ten-hour day for laborers; he was a member of the Massachusetts House of Representatives in 1853, and of the state senate in 1859, and was a delegate to the Democratic national conventions from 1848 to 1860. In that of 1860 at Charleston he advocated the nomination of Jefferson Davis and opposed Stephen A. Douglas, and in the ensuing campaign he supported John C. Breckinridge. 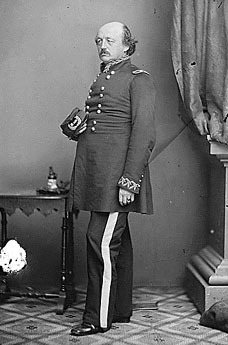 After the Baltimore riot at the opening of the Civil War, Butler, as a brigadier-general in the state militia, was sent by Governor John A. Andrew, with a force of Massachusetts troops, to reopen communication between the Union states and the Federal capital. By his energetic and careful work Butler achieved his purpose without fighting, and he was soon afterwards made major-general, U.S.V. While in command at Fortress Monroe, he declined to return to their owners fugitive slaves who had come within his lines, on the ground that, as laborers for fortifications, etc., they were contraband of war, thus originating the phrase "contraband" as applied to the negroes. In the conduct of tactical operations Butler was almost uniformly unsuccessful, and his first action at Big Bethel, Virginia, was a humiliating defeat for the National arms. Later in 1861 he commanded an expeditionary force, which, in conjunction with the navy, took Forts Hatteras and Clark, North Carolina. In 1862 he commanded the force which occupied New Orleans. In the administration of that city he showed great firmness and severity. New Orleans was unusually healthy and orderly during the Butler regime. Many of his acts, however, gave great offense, particularly the seizure of $800,000 which had been deposited in the office of the Dutch consul, and an order, issued after some provocation, on May 15th, that if any woman should "insult or show contempt for any officer or soldier of the United States, she shall be regarded and shall be held liable to be treated as a woman of the town plying her avocation." This order provoked protests both in the North and the South, and also abroad, particularly in England and France, and it was doubtless the cause of his removal in December 1862. On the 1st of June he had executed one W. B. Mumford, who had torn down a United States flag placed by David Farragut on the United States mint; and for this execution he was denounced (December 1862) by President Jefferson Davis as "a felon deserving capital punishment", who if captured should be reserved for execution. In the campaign of 1864 he was placed at the head of the Army of the James, which he commanded creditably in several battles. But his mismanagement of the expedition against Fort Fisher, North Carolina, led to his recall by General Ulysses S. Grant in December. He was a Republican representative in Congress from 1867 to 1879, except in 1875-77. In Congress he was conspicuous as a Radical Republican in Reconstruction legislation, and was one of the managers selected by the House to conduct the impeachment, before the Senate, of President Andrew Johnson, opening the case and taking the most prominent part in it on his side; he exercised a marked influence over President Grant and was regarded as his spokesman in the House, and he was one of the foremost advocates of the payment in "greenbacks" of the government bonds. In 1871 he was a defeated candidate for governor of Massachusetts, and also in 1879 when he ran on the Democratic and Greenback tickets, but in 1882 he was elected by the Democrats who received no other state offices. In 1883 he was defeated on renomination. As presidential nominee of the Greenback and Anti-Monopolist parties, he polled 175,370 votes in 1884, when he had bitterly opposed the nomination by the Democratic party of Grover Cleveland, to defeat whom he tried to "throw" his own votes in Massachusetts and New York to the Republican candidate. His professional income as a lawyer was estimated at $100,000 per annum shortly before his death at Washington, DC, on the 11th of January 1893. He was an able but erratic administrator and soldier, and a brilliant lawyer. As a politician he excited bitter opposition, and was charged, apparently with justice, with corruption and venality in conniving at and sharing the profits of illicit trade with the Confederates carried on by his brother at New Orleans and by his brother-in-law in the department of Virginia and North Carolina, while General Butler was in command. Democrat, then Republican, later Democrat.